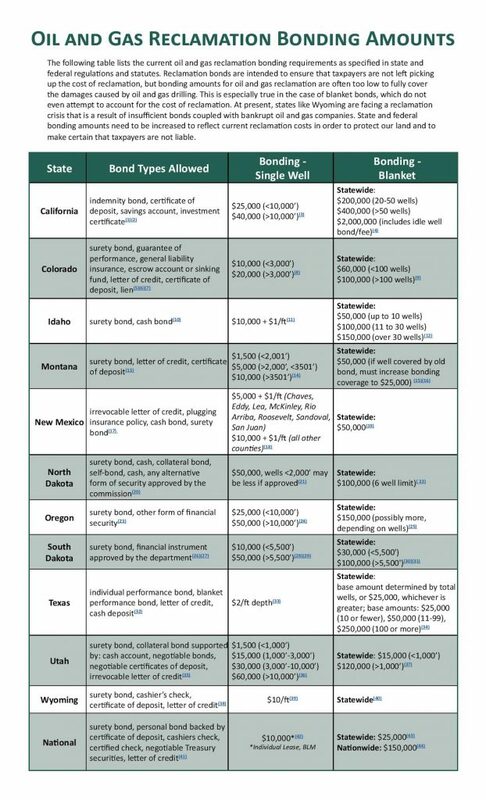 The Oil and Gas Reclamation Bonding Amounts matrix lists the bonding requirements for 11 states and the federal government. Reclamation bonds are intended to ensure that the companies, not taxpayers, pay for well recovery. Bond amounts, however, are often too low to cover the damages from drilling. This is especially true with blanket bonds. A blanket bond sets an amount to reclaim, theoretically, all of an operator’s wells within a state or across the country. Oil and gas bonding is problematic because of the boom and bust nature of the industry. States like Wyoming face a reclamation crisis because of insufficient bonds, coupled with bankrupt oil and gas companies. A review highlights weak bonding requirements for Western oil and gas producing states and for federal lands and minerals. Weaknesses include low bond amounts, blanket bonds, and, and “self bonding,” which lets companies simply promise to pay reclamation costs in the future. Some states allow alarmingly low bond amounts. South Dakota, Utah and the BLM require minimum statewide blanket bonding amounts of $30,000 or less. In Texas, the single well bond is only $2 per foot of well depth. Montana and Utah set minimum single well bond amounts of only $1,500. When you consider the actual costs of reclamation, bonding amounts are too low. A study of reclamation costs in Wyoming found that the average cost to reclaim a single well ranged from $569 to $527,829. Some newer, deeper wells may cost $17 million per well to reclaim. By that measure, the blanket bond of $50,000 in New Mexico and several other states may not reclaim even one well, much less all of an operator’s wells in the state. Bonding amounts should reflect current reclamation costs to protect our land and taxpayer liability. 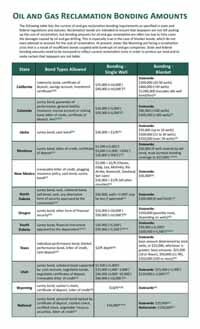 The following table summarizes oil and gas reclamation bonding requirements as specified in state and federal regulations and statutes.